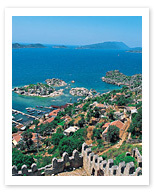 You can visit these islands by boat from nearby Kas or Demre. The boat ride is an amazing trip in itself even if you don’t drop anchor and tramp up to explore the hillsides scattered with Lycian ruins, or Simena’s castle and the rustic, charming appeal of the town above. Passing along the numerous coves and inlets, looking down into the crystal-clear water of the Mediterranean, you may catch glimpses a city long since submerged, a real Atlantis, with remains of buildings, streets, and even an underground harbor visible just below the surface.